Older women continue to dominate in lower-income jobs, according to recently released figures from the Ministry of Manpower. More than seven in 10 of nearly 100,000 women aged 60 and above who worked last year earned less than $2,000 per month, the Labour Force Survey showed. And while the gender wage gap in Singapore is roughly the same as that in New York or London - with women earning nearly 88 per cent of the median pay of men overall - the difference widens with age. Being lesser educated, women over 60 who worked full-time earned a median income of $1,623 last year, well below the $3,500 monthly wage for all women and the $2,158 for older men. Their real incomes however have risen faster than that of older men. Five years earlier, older women earned a median income of just $1,040. "This shows that despite recent improvements in wages, too many older women here are still earning too little," pointed out gender consultant Theresa Devasahayam who has just completed a 180-page report on the challenges of older women. It was commissioned by the International Longevity Centre Singapore, a part of the Tsao Foundation. Older women were most likely still working or returning to work mainly because they needed the money. "They may not have saved enough and so may still need to work," she said. Buoyed possibly by a tight labour market, the number of women aged 60 and above who work as cleaners rose by 70 per cent to 34,100 last year, from 19,800 just five years earlier. Tsao Foundation chairman Mary Ann Tsao acknowledged that younger women are better placed to prepare financially for old age. But older ones are still a concern. "It's really not enough to say the wage or savings gap has narrowed, as women actually need to have more resources than men as they live longer," said Dr Tsao. Women also progressively outnumber men as they age. By their 80s, there are twice as many women as men. They are also more likely than men to be single, widowed or divorced (see chart). 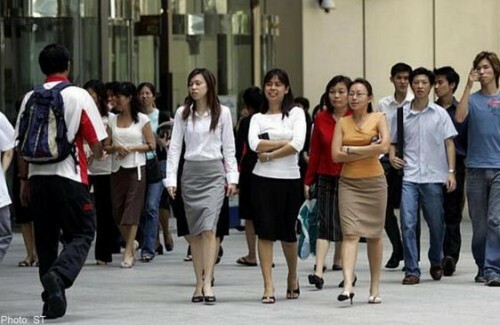 Experts say women's lower earnings directly and adversely affect their retirement adequacy, since Singapore operates an earnings-based pension system. As of December 2013, women over 60 had an average of around $40,000 in their CPF accounts compared to nearly $60,000 for men the same age. There has of course been a push by the Government in recent years to shore up wages, employment rates and retirement savings of older workers through a slew of schemes. These include Workfare (an income supplement for low-wage workers), higher CPF contribution rates for older workers, and incentives for companies that hire them. Wages too have risen, as has welfare. The recently announced Silver Support Scheme will help boost the income of needy older citizens further, even if they don't work. But there are four groups of older women who face a vulnerable financial future, say experts The Sunday Times spoke to. They include those who are single, housewives, part-time workers, and caregivers who quit work to look after loved ones in fast-ageing Singapore. Although more women than ever are working, there are still more than half a million aged 25 and above who do not work, and most cite housework, childcare or caregiving as the main reason. Last weekend, the women's wing of the People's Action Party called on husbands and adult working children to make regular voluntary top-ups to the CPF accounts of stay-at-home mothers. Similar calls were made by Aware and the Tsao Foundation a decade ago. Institute of Policy Studies research fellow Christopher Gee, who studies ageing and retirement adequacy issues, has suggested a scheme where a working spouse can make regular, automatic contributions to the CPF accounts of non-working spouses. "This would help in the more rapid accumulation of CPF savings, given the additional interest on balances below $60,000 in the CPF," he said. Another way to improve the retirement adequacy of older widowed women with meagre CPF savings is to add a spousal survivorship benefit to CPF Life, says Mr Gee, referring to the national annuity scheme that allows retirees to receive a monthly income for life. This way, a widow can continue receiving payouts to support her retirement even after her husband dies. "Payouts can be calculated on the basis of expected longevity of the surviving spouse, which in most cases will be assumed to be the woman," he said. Women who stop working to care for sick family members are another concern. Many of them are single and compromise their own financial security. The stress of looking after a loved one can also take a toll on their health. "We must count the opportunity cost to these women, " said Dr Tsao. She said that the Government could consider giving "caregiver credits" to help reduce fees when caregivers need to pay for their own care services in future. Workplaces should expand flexiwork and job-sharing schemes to help women tend to their caregiving duties even as they work. Part-time workers who drift in and out of the workforce are another group to watch out for, pointed out Ms Teo Mee Hong, executive director of Wings, a voluntary organisation that helps women age well. She has spoken to low-wage women who work part-time because there are not enough full-time jobs available for them. Of late, she has noticed another phenomenon. In the tight labour market, some women say they can earn more on an hourly basis doing two or more part-time jobs than from a full-time job. But some may work for employers who do not pay enough CPF, Ms Teo said, adding: "In such cases, and in the long run, it's the workers who would lose out." Employers must also play their part in ensuring older workers who stay on or return to the workforce earn a decent wage. Those who do not have degrees but have risen through the ranks to managerial positions are a concern, said human resource consultant Helen Lim, who helps older workers stay employed. "Right now there are many who don't get jobs even though they're willing to take pay cuts," she said. Economist Linda Lim says raising wages is one key way to boost productivity in lower-skilled jobs. "This will incentivise employers to devise more efficient processes and employ fewer workers but at higher wages," said Prof Lim, a Singaporean who teaches business strategy at the University of Michigan in the United States. It will also motivate workers better and reduce labour turnover - a major cause of low productivity. "This is what companies like Wal-Mart are doing in the US - raising wages well above minimum wage," she said.